First impressions are important, and my first impression of Casa Olympe, the highly-touted quasi-Corsican establishment in the 9th, was definitely favorable. This may have largely been attributed to the sign I saw attached to the front wall informing patrons, “Portable Interdit” (no cellphones allowed). That’s my kind of sign. In part, it accounted for a steady stream of patrons casually leaving their table throughout the evening and stepping outside to check their sacred messages or make that life-altering call that simply could not wait another hour or so. Idjits. In addition to the steady stream of patrons stepping out for a smoke, and another contingent in tandem, dashing in mad panic to move their illegally-parked cars, the filled restaurant at times seemed veritably empty. Which is a pretty good thing in a restaurant like Olympe, where the expression, “I want to be alone” does not compute. The main room, consisting of about 36 places lined along the left and right walls, barely left an unoccupied centimeter – a common hazard in Paris, where real estate is at a premium. 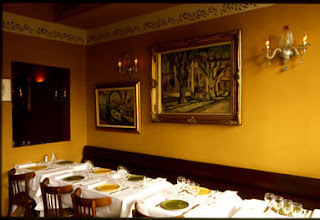 Nevertheless, it’s a finally-appointed room (in addition to a couple tables in a small, back room near the bar), with butterscotch walls, murano chandeliers, and classical paintings interspersed along the walls. And the neighborhood warrants a visit. Casa Olympe is owned and run by Olympe (aka Dominique) Versini, one of the most famous female chefs in Paris. You can get the full history at the restaurant’s website. 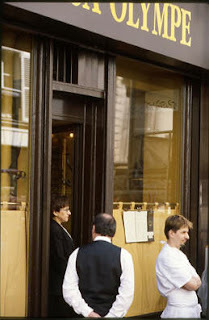 The restaurant critic Alexandra Lobrano claimed to have been at Olympe one evening when Jean-Paul Gaultier arrived just before closing time with some friends. I bet Jean-Paul received a warmer welcome than your’s truly, despite arriving finely appointed with Co. only a half hour after the doors opened. But I’ve lived in Paris long enough, so I get it. You must first earn Olympe’s respect and, because this was my first visit, I obviously have not had the opportunity to prove myself as a worthy patron. Overall, however, I can’t complain about the icy yet efficient service. Coats taken, we were seated and immediately brought a plate of small, black olives to accompany our perusal of the carte. In addition, a small chalkboard on the far wall informed us of two entrées, two plats, and two desserts special for that evening, with a couple bearing a modest 5€ supplement. Co. and I ruminated long and hard over the choices, several of which competed for our favors. This typically takes some negotiating – I refuse to take any dish that Co. opts for because that simply reduces the sample size and the fun. Okay, that epic white chocolate dessert at Ze Kitchen Galerie was a clear exception to that rule. But it’s nice for a change to really have difficulty making up my mind. The emphasis is on Corsican and Mediterranean dishes at Olympe, with a specialty being the roasted shoulder of lamb that must be shared by at least two at the table. I don’t eat lamb, so that ruled out at least one possibility. I couldn’t talk Co. out of the special entrée of paloudes sautee au thyme (small clams sautéed in their shell with thyme), so I went with an option you won’t find listed on the website’s menu, a dish comprised of betterave and bulots. This took the form of thinly sliced pieces of beet sandwiching a concoction of marine snails. If you read my earlier Finland posting you must be thinking, ‘my lord, this must be the year of the beetroot!’ I’m afraid I can’t disagree with you. Once repulsed by the bloody things, I find myself increasingly fascinated by what can be done with the underrated beet. This dish, although inspiring, didn’t reach the euphoric heights as that goat cheese dish or the salmon, beetroot, and rye entrée in Finland, but it was pretty damn good. Ironically, because it was my first choice, Co. wasn’t all that impressed with her clams, which she found unimaginative (and, depressingly, at least three of the shells had to pried open with force). She regretted passing on the croustillants de boudin, mesclun. Maybe next time. As for the main dishes, Co. found the ris de veau croustillants with capres de Pantelleria much more satisfying (see the photo). I was more than pleased with my espadon (swordfish) lightly cooked (nearly raw inside, as I prefer) in a coco sauce, innocently lying on a bed of vegetable strips. 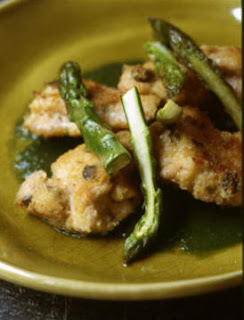 What started out as a pretty simple dish seemed to grow in complexity as the sauce kicked in. Co. was rather disappointed with the dessert on special for the night, a white cream with red fruits dish. I didn’t find the dessert options very inspiring, but my moelleux tiede chocolate noix was more than adequate. As for the wine, I couldn’t resist the Corsican (Corse Patrimonio – Antoine Arena 2005), reasonably priced at 33€. Though forewarned that this was a mildly sparkling red, I stuck with the choice because I’ve never met a Corsican wine yet that I didn’t like. I’m no fan of sparkling alcohol of any sort, and that includes champagne, but the Corse Patrimonio turned out to be a tasty complement to our dishes. Overall, I’d have to say that Olympe warrants the many favorable reviews you’ll find in your restaurant guides. I wouldn’t go so far as to say there was anything incredibly special about it, but my interest has been piqued and I’m ready to try out some of the other menu options. That, of course, assumes that Olympe is willing to have me. Did I create a good impression? I don’t know, but I managed to resist strangling the obnoxious couple sitting next to us who were touchy-feely beyond even Parisian standards of decorum. Idjits. So be forewarned. Olympe would be a great place for a romantic dinner – if there were no other diners. But expect the restaurant to be full and that means you better not mind eating shoulder to shoulder with strangers. Jean-Paul excluded, of course. Price: Two ‘menus’ (entrée, plate, dessert) at 43€ each + wine (33€) + one coffee (4€) for a total of 123€. 48 rue Saint-Georges, Paris 75009.